This quarter I have chosen the pancreas because this organ recently made the headlines when Steve Jobs became yet another household name to join the list of those who lost their battle against pancreatic cancer. Other celebrities who have fallen victim to this disease include Luciano Pavarotti (d. 2007) and Patrick Swayze (d. 2009). The pancreas is part of our digestive system. After our food has been swallowed it moves down the oesophagus by peristalsis and enters the stomach via a muscular gateway called the cardiac sphincter (see diagram below). Peristalsis gets to work in the stomach too but the food is also subject to enzymes that break down proteins (proteases) as well as hydrochloric acid that kills bacteria and provides a pH that helps the proteases to work. 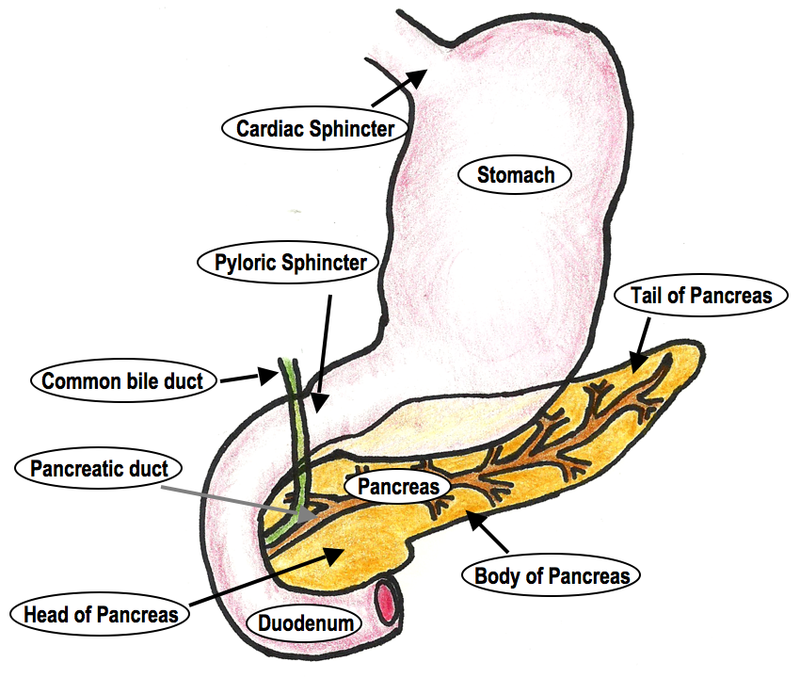 From here, the partly digested food leaves the stomach via another muscular gateway (the pyloric sphincter) and enters the duodenum; and here’s where the pancreas comes in. Sitting just behind the stomach, spanning from the duodenum to the spleen, the primary function of the pancreas is to produce digestive enzymes and buffers; both of which are triggered by the release of the duodenal hormones cholecystokinin and secretin, respectively. Dependent on the content of the food, these juices are periodically secreted into the duodenum (about 1 litre a day) via the pancreatic duct – this also joins with the common bile duct from the liver and gallbladder, which secretes bile into the duodenum. The acini (only two examples are outlined above) secrete the pancreatic juices into the intercalated ducts found at their centre. The intralobular ducts then receive the secretions from the intercalated ducts. 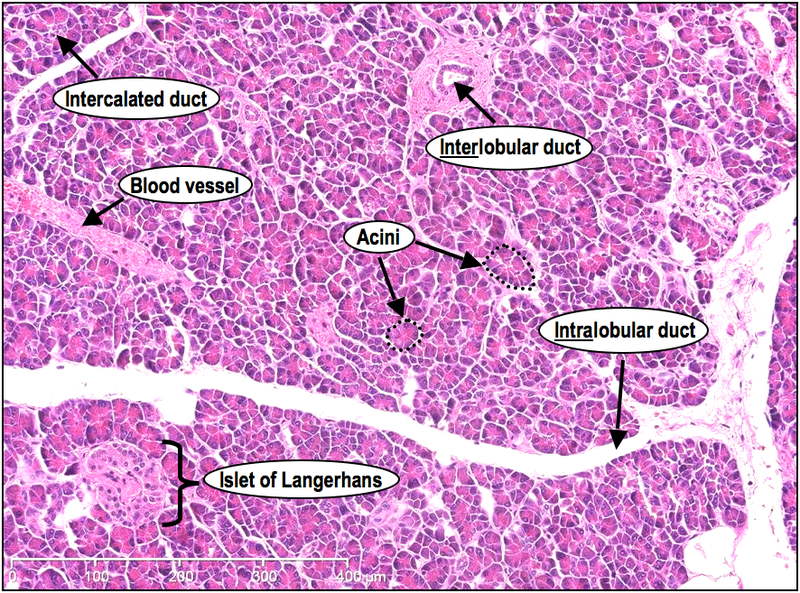 The interlobular ducts, with their varied sizes and surrounding bands of collagen, then receive the secretions from the intralobular ducts and transport them to the pancreatic duct to be secreted into the duodenum. 1) pancreatic alpha-amylase – known as a carbohydrase because it breaks down carbohydrates. 3) proteolytic enzymes – a) proteases which break down large protein complexes b) peptidases which break down smaller proteins (peptides) into individual amino acids. 4) nuclease – for breaking down nucleic acids. Interestingly, although 70% of the total enzymes produced by the pancreas are the proteolytic enzymes, they are in fact secreted in an inactive form; they only become activated when they reach the small intestine. If they were active within the pancreas they would also digest the acini that produced them and that would destroy the tissue. The chyme, as a result of the low pH in the stomach, is quite acidic and the subsequent increase in the acidity of the duodenum needs to be neutralised. Luckily, this low pH triggers the release of secretin, which controls how much buffer (both bicarbonate and phosphate) is secreted into the duodenum in order to control the pH level there. 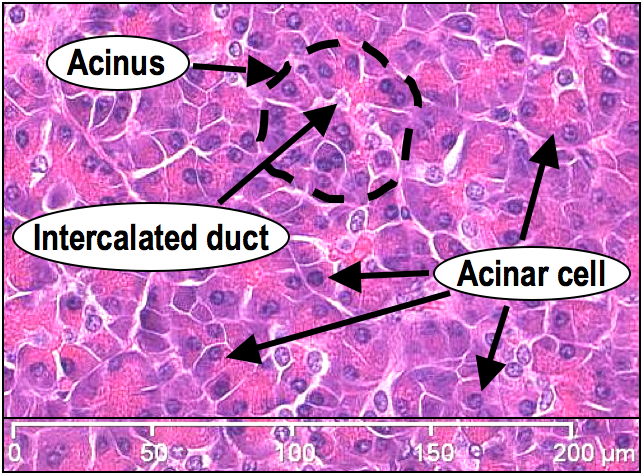 As the acini of the pancreas secrete into a network of ducts, this gives this organ an exocrine function. The H&E photomicrograph opposite shows a higher magnification of the enzyme and buffer secreting acini, demonstrating more clearly the multiple clusters of cells (simple cuboidal epithelial and acinar cells) that make up these and how they encircle the intercalated ducts. The secondary function of the pancreas, however, is to produce two other hormones called insulin and glucagon. These are produced in structures known as Islets of Langerhans, (more specifically the beta and alpha cells of the Islets, which produce insulin and glucagon respectively). As these hormones are secreted into the bloodstream and not into ducts, this makes the pancreas an endocrine organ too. The endocrine function of the Islet of Langerhans is involved in the monitoring of blood sugar (glucose) levels. When there is a high concentration of sugar in the blood, the beta cells release insulin. Insulin induces the uptake of the surplus sugar by muscle, fat and liver cells so that it can be stored as glycogen, so not to overload the blood stream. High blood sugar is also known as “hyperglycaemia” and severe cases occur when the pancreas fails to produce insulin, or the insulin being produced is dysfunctional – a condition known as diabetes mellitus (Type 1 diabetes). Hyperglycaemia can lead to a condition known as ketoacidosis, in which the body is not able to break down sugar for energy, instead it breaks down fat. Ketones are a byproduct of fat catabolism, but the body is not very effective at getting rid of this waste and so they aberrantly build up in the blood. The distinctive symptom of ketoacidosis is the fruity odour of the person’s breath; but don’t be fooled by this minor pleasantry; this condition can lead to diabetic coma, can be life threatening and must be treated immediately with an injection of insulin. At the other end of the spectrum when someone experiences low blood sugar, or “hypoglycaemia”, this triggers the alpha cells to release glucagon. Glucagon induces the conversion of the glycogen stores in the liver, back to glucose so that blood sugar levels can be restored once again. As with hypercglycaemia, people with Type 1 diabetes are also prone to hypoglycaemia if, for example, they have injected too high a dose of insulin. Most of the time this is easily resolved by eating or drinking something sugary; however, in severe cases, the alarm signs are not always prominent and the person can slip into a diabetic coma within 20 minutes to an hour of the early warnings. Treatment requires intravenous administration of glucose or an injection of glucagon to increase the blood sugar to a safe level. As you can see, our pancreas has two vital functions – food digestion and blood sugar control. If there are any problems with these functions, our body soon tells us and they can be easily rectified with simple interventions. As for pancreatic cancer, however, sufferers are not always fortunate enough to experience early warning signs and usually, by the time of diagnosis, the cancer has become too advanced to eradicate. However, 70% of pancreatic cancers arise from the head and sometimes they cause obstructions to the bile duct, leading to jaundice; further investigations into the cause of jaundice can lead to early detection of the cancer. In this case, there is a good chance of curative surgery; a radical operation known as the Whipple procedure. 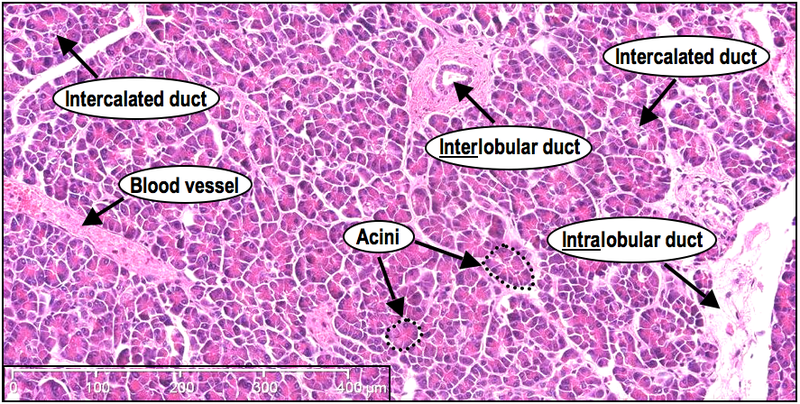 Hi, I’m working on pancreas histology and would like to learn from you. 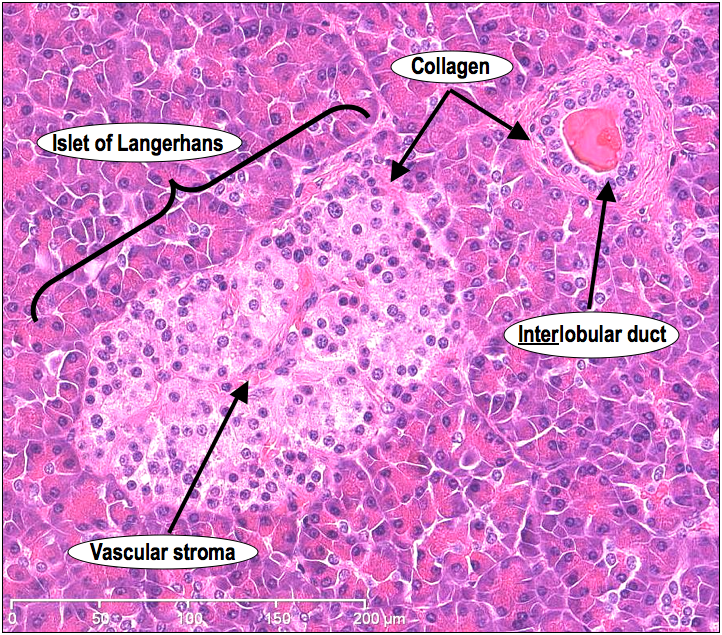 Hi, I’m working on histology as well, particularly pancreas tissue, and would like to learn from you. Hi there! I have just replied to your message on my Facebook page. Hope I can help.